The Following Blu-ray Disc Review Contains Major Spoilers. 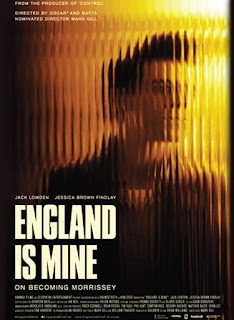 England Is Mine is a biographical dramatization of the early life of Stephen Morrissey, the lead singer of the 1980’s iconic alternative band, The Smiths and later he went on to enjoy a successful solo career. I met Morrissey while he was shopping for music at the Virgin Mega Store Time Square in the 1990s. I was amazed by how down to Earth he was and engaging as well. I only got to speak to him for a few minutes before fans began to descend upon him, but I am very glad that I was able to share a few words with him and he seemed interested in what I had to say. I loved The Smiths in high school and felt the fusion between Morrissey’s singing and lyrics and Johnny Marr’s rocking guitar was what made The Smiths stand out and to this day new generations of teenagers and college kids discover Morrissey and The Smiths as a voice for the universal angst of generations. England Is Mine focuses upon a very specific time in Morrissey’s life from 1976 to the early 1980s when Morrissey goes to see Johnny Marr after having met him for the first time a day or so before and having shared some similar taste in music and style. Morrissey is depicted as being a somewhat introverted and bookish young man from what I describe as a blue-collar middle class family in Manchester not too unlike what I imagine a lot of people who grow up in western society experience. He simply does not fit in with following what is expected of him, which is to get a job in an office or a hospital and work and live what I think he consider a humdrum life devoid of any dreams or aspirations toward working within the arts. He makes friends with young woman who paints and a guitarist that help bring him out of his shell. However when both of his friends leave for artistic opportunities in London, Morrissey must find the strength within to become his own man. Then one day Johnny Marr knocks on his door. That’s it. That is the whole movie and that is about as much depth we get, which I think is a big problem with the film. At approximately 95 minutes, I felt the film ends just when it starts to get interesting. I never felt much emotional attachment for any of the characters and compared to other biopics like one produced about the late Joy Division singer Ian Curtis entitled Control, which was produced by one of the producers of this film, England Is Mine feels like a TV movie more than a feature film and it just lacks enough emotional resonance that made me feel as though I understood Morrissey as a human being better after seeing the movie than I did before. That is why I opened this review with my brief meeting with the real Morrissey in Time Square. I got more out of casually talking with the man than I did watching this whole feature and I just shared a few brief verbal exchanges. I did not interview the guy and I’m pretty sure the experience was more memorable for me than it was for him. I am sorry too because the film is well acted with Dunkirk star Jack Lowden as Steven Morrissey and the beautiful Jessica Brown Findlay as Morrissey’s painting friend Linda Sterling. Simone Kirby is quite good as Morrissey’s supportive Mother, but even here, the film seems to just show scenes that amount to instances that are repeated throughout the film. Morrissey had some trouble fitting in. Not everyone was nice to him. He had to work in jobs he hated. He stayed up late reading and writing while his father was unsympathetic and told him to get a job. So what? This sounds like the biography of my life and millions of other people except Morrissey got lucky and became famous. He is talented so I only mention luck because there are plenty of untalented people who are famous on the television every day thus talent is not a guarantee of anything anymore than a college guarantee a graduating student a job once he has completed his or her studies. Plus he sort of just starts looking and dressing like the Morrissey we have come to know because he read a lot of books and stared at a picture of James Dean. What was he reading? I don’t know. Why did his father suddenly back off when usually the longer an unemployed son or daughter lives with his parents the greater the anxiety over his future begins to build up in his or her parents. So with no emotional resonance, I think even diehard fans in America at least will be somewhat disappointed by the film’s lack of depth and it’s ending, which as noted above feels like the point when the story was just starting to get interesting. England Is Mine features a retrospective feature length audio commentary with Director Mark Gill and Star Jack Lowden. Personally I found the featurette Smoke And Mirrors (21:54) with Cinematographer Nicholas D. Knowland, B.S.C. to be far more engaging than any of the other extra features included on this Blu-ray Disc. A behind-the-scenes short entitled Sad Facts Little Known (8:28) is also included along with a somewhat bland motion still gallery (3:42). The film is presented with a beautiful high definition 1080p/24fps AVC encoded picture along with a choice of English DTS-HD MA or English Linear PCM 2.0 Soundtracks and optional English Subtitles. 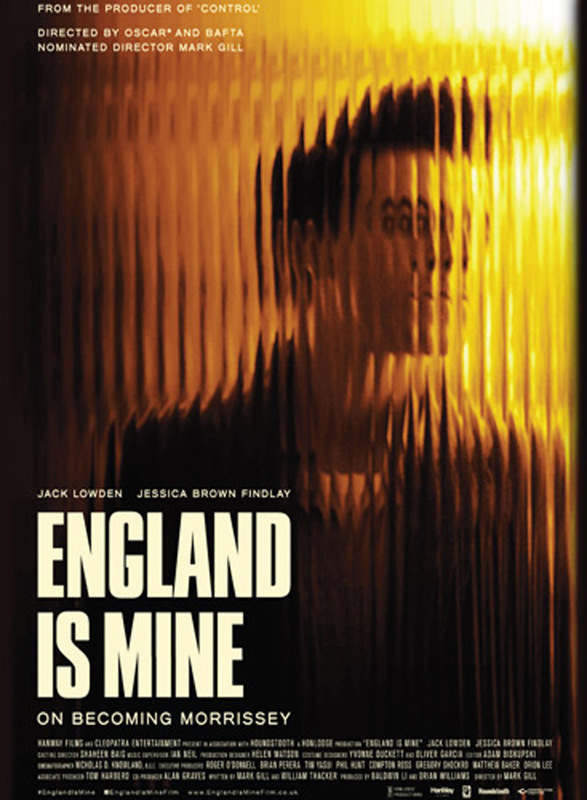 England Is Mine, also known as England Is Mine: On Becoming Morrissey is available now on Blu-ray Disc at retailers on and offline courtesy of MVD Visual Entertainment Group and Cleopatra Entertainment.